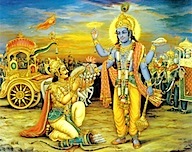 Gita Jayanti is a celebration of the gift of the Bhagavad Gita by Lord Krishna to the people of the world. It is celebrated on the Ekadashi or 11th day of the bright half of the lunar month in December/January every year (16th December 2010). The occasion is celebrated with special readings of the Bhagavad Gita in temples and hindu organizations across the world. Some organizations also distribute copies of the Gita for free to promote the message of this holy scripture. Prince Arjuna was overcome by doubt and fear as he faced the prospect of doing battle with his half-brothers, gurus and friends. Lord Krishna, an incarnation of Lord Vishnu, removed his doubts by teaching him about the four-fold yogas of karma (action), bhakti (devotion), gyana (devotion) and prema (love). We will be featuring more articles on the Bhagavad Gita in the month of December – stay tuned! A minor correction: In the four folds of yoga Gyana is the path of the knowledge and not devotion.